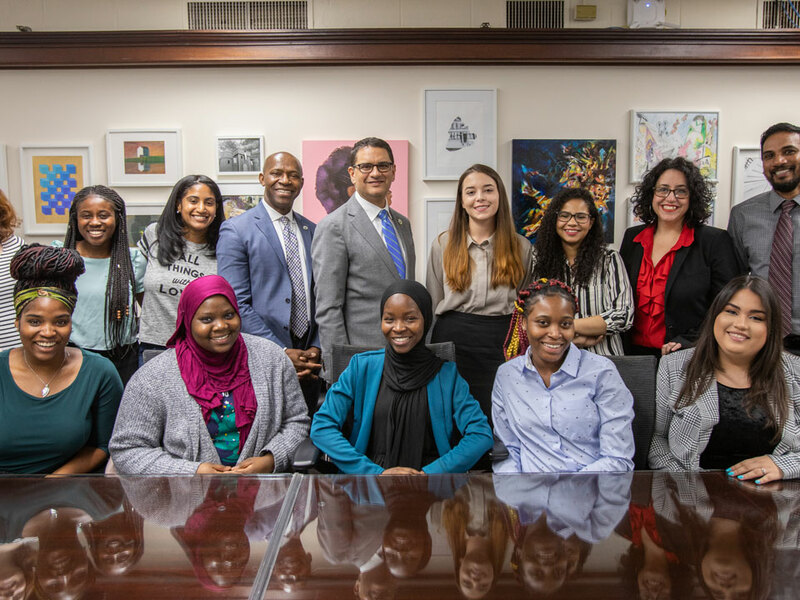 It was an auspicious start to the new year for 10 Lehman students who received awards from the Benjamin A. Gilman International Scholarship program and the Chancellor’s Global Scholarship to study abroad in 2019. During a small reception held in honor of the award recipients, President José Luis Cruz and Provost Peter O. Nwosu chatted with the group. Many of the students had just returned from their trips and spoke excitedly about their experiences—from the application process to the thrill of being in a new country and communicating in a different language. Villa 25 is a hostel located in the Largo do Machado neighborhood in Rio de Janeiro, Brazil. Its proximity to stores, restaurants, and public transportation made it the ideal place to stay for anthropology major Natalie Aracena, who was there during the winter break. Through the Council on International Exchange Education program (CIEE), she took a class, titled “Understanding Brazil Through Intercultural Engagement,” that included visits to Rio’s various neighborhoods. Recreational Therapy major Nanahawa Bagigah spent the month of January in Rome absorbing Italian culture and history with visits to the Colosseum, Vatican City, and day trips to Paris. She also ate a lot of pizza, gelato, and pasta. Helina Owusu-Sekyere, a biology major, is grateful to the Gilman Scholarship because it allowed her the opportunity to study in India. She spent the break working with the Comprehensive Rural Health Project at Jamkhed. There she was able to see first-hand the passion and commitment of practitioners delivering healthcare to underserved populations. International Business major Nicole Flores, who has never traveled outside of the country or been on a plane, is looking forward to her trip to Singapore in April. For five months, she will study at Nanyang Polytechnic through Lehman’s exchange program with the school. She says she was drawn to Singapore because of its mix of different cultures. “I am a first-generation college student. Opportunities like this are few and far between for me, so I just had to go for it,” said Flores. Aileen Pelegrin, a multimedia performing arts major, boarded a flight to France in January to study at the Montpellier University through another of Lehman’s exchange programs. She’ll be taking classes to fulfill her business administration minor requirements. She says she’s excited to live alone for the first time, to meet people, take lots of pictures, and explore the country. The Benjamin A. Gilman International Scholarship is sponsored by the United States Department of State. Since 2015, Lehman has had 45 Gilman recipients, and was named a Top Producer of Gilman Scholars for 2016-2017.